Just what your little fireman needs to take care of any emergency - this pedal-powered truck is complete with real working lights, siren, PA system, and more! 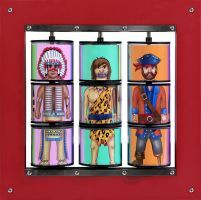 Another Busy Cube wall panel, the Funny People Twister is another great interactive toy for kids. They'll learn pattern matching and improve their logic skills while they have fun with these crazy characters!